Welcome to the world of Samantha Moon, wife, mother, private investigator...and vampire. Six years ago Sam was attacked, her throat nearly ripped out. She woke up forever altered, with no clear understanding of what she is or what she's capable of. Now that her husband is cheating on her and telling her she repulses him, and her children have to deal with a mother that can't go out into the sun without slathering on the SPF100, and she's pretty sure her newest client is a werewolf, Samantha is just starting to wonder about the meaning behind it all, behind what she is, who she is, and how the rest of her...life...is going to play out. This existential quandary goes hand in hand with a mystery that she's uniquely qualified to solve, what with that sixth sense of hers. I very much enjoyed this quirky debut in J.R. Rain's Vampire for Hire series and sincerely hope to get to spend a lot more time with Sam, Fang, the sometimes furry but always fabulous Kingsley, and of course, homicide detective Sherbet. While the book is certainly not flawless nor perfectly edited, I can't say that I cared overmuch in this case because Sam's story kept me thoroughly entertained. 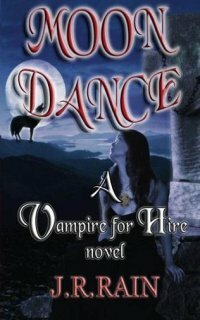 Yes, there were grammar issues, and some extra words in sentences, and spelling issues here and there, but if you can forgive those minor technical points in favor of a swiftly paced, nifty little story, I'd recommend you give Moon Dance a try. It's true that the narrative, told in first person from Samantha's point of view, is bare bones to the point of ultimately economical. You're surely not going to get a lot of flowery descriptive passages...or much of any description at all of the world around Sam. What you do glean, you do on your own as you work your way through rapid fire and quick witted thoughts and dialogue that borders on deadpan yet cuts sharply. The characters are loosely defined and perhaps an argument could be made that they border on cliche in some cases, but their actions definitely speak louder than words in this book. This writing style normally wouldn't work for me, but something about Moon Dance was compelling. I'd tell you if I knew what it was, but frankly, I'm not entirely sure. I do know I thoroughly enjoyed Samantha, even when she got a little too depressing about the sudden and admittedly horrific shift in her marital status. Honestly, I wouldn't blame her for eating that louse of a husband of hers, Danny. Couldn't happen to a more deserving bloke, that's for sure. I also have to say there was a lot of originality to be had in this story, and not just a little imagination. It's not every day, after all, that a vampire hunter gets picked up by a big, vampiric...thing...and flown out over the ocean to be set down on a Carnival cruise ship on its way to Hawaii. It sure was fun, though. There's little doubt that this book probably won't appeal to everyone. Some of its quirks may not translate well to a mass market audience used to more traditional stories. Those that miss it, though, are missing a true rough gem. I enjoyed Sam's online confidant, Fang. A man of mystery in every sense, that one. I highly enjoyed the dance between Sam and the cop, Sherbet. Sam likes his name because it reminds her of ice cream. Sherbet hates his name because it reminds him of ice cream. For some reason, that tickles me. Her client is a real dog but a gentleman about it. Honestly, what's not to like? Well, okay, the attempt at the romance between Sam and Kingsley was oddly perfunctory and came out of nowhere. I actually backed up a few pages just prior to Kingsley declaring his affections just to see if I missed anything. When I realized I hadn't, I was even more perplexed. There was no build up and very little interaction at all between Sam and Kingsley so I was very surprised by that turn, and didn't think it was written out very well for the reader. Other than that, though, I recommend you give Moon Dance a try. I'll be waiting for my next chance to read about Samantha with bated (though perhaps not quite as bated as Samantha's) breath. Happy reading.